Farmer’s Markets are not new to many of us, but some find the whole thing a little daunting. So, as this season of shopping locally and from farmers who grow our food is in full swing we are sharing our best ideas and tips for making the most of your next farmer’s market excursion. If you’ve read this blog for long, you have a good idea that I am a menu planner, so before I head out to the market I always think ahead about what’s up for the dinners in the coming week. I consider what I can harvest from the garden and what has to be filled in from other sources, then I make a list. Once I’m at the market though I keep an eye out for anything that looks particularly good or interesting that I can build a meal around, whether it’s on my list or not. It’s simple enough to change a menu if I find something unexpected or a great deal. Other things I bring include recycled plastic bags to hold veggies, a shopping bag and a nice sturdy roller cart. If it is especially hot on market day and I think I may be out for a while I sometimes bring an ice crest to hold heat-sensitive veggies so they don’t wilt on the way home. However, since I usually swing by the market on my way home from work the ice chest is a rare companion. One of the great experiences of shopping at the farmer’s market is the ability to talk with people who grow our food, so chat away, folks! If you’re at a loss of what to talk about ask how to properly select a certain fruit or vegetable, their favorite way to cook a particular vegetable, when the ______ might be ready for harvest, or how the recent weather has impacted their crops. If you’re interested in organically grown but there’s no sign ask the farmer about his growing methods, how they boost the fertility of the soil or how they control damaging pests. This can be a touchy subject for some, so please tread lightly. You can be inquisitive, but don’t interrogate. Don’t be shy folks, building a bond with growers will enrich your market day, but remember you’re not the only shopper there, try not to monopolize the farmers time. Also, remember that bringing this produce, meat, cheese, baked goods, flowers, etc. to your community has taken hours of time and hard labor. Even if the quality is not as pristine as you’d like to see please don’t make faces or snide comments, be respectful and remember…you don’t have to buy it. At many markets I’ve visited, the price posted is the price, but in some areas haggling is accepted. If this for you, try asking if the price is firm rather than demanding a lower price because of some perceived flaw in the product. Better yet, if you’re a bargain hunter shop late in the day when farmers are more apt to slash the price rather than take produce home. And…for you seniors out there many market now have senior discounts or coupons, so check with your market management. If you plan on shopping for large quantities of an item for a party or for canning make arrangements with the farmer ahead of time. Most are happy to bring lugs of a particular item rather than be bought out in one transaction. Many times, too, you can get a better price especially if you can use seconds, like for making sauce or chutney’s. I like to walk through the whole market, looking at everything and tasting before deciding which stalls to buy from. Others like to hunt and gather their way through, buying as they go, while still others have favorite vendors they buy certain items from week-after-week. Your shopping style really isn’t important, but if you’re new to farmer’s markets you may want to go with a plan. Being a “regular” at a farmers market is fun. You’ll gain a sense of belonging, get to know the farmers and other regular shoppers a little bit, and you’ll be known as a loyal customer. All nice things. Get to know the market organizers also. Our market has an information table manned by the market staff. Getting to know them makes it easier to bring up concerns, wished for products or make suggestions. And—if you are nice and helpful you may even see your comments or suggestions come alive at the market. 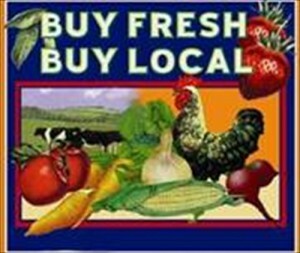 Your local farmers market is part of your community, so talk it up! The more you and your neighbors go – and spend money! – the stronger and more diverse your market will become. If your town gets a reputation as a place that supports locally grown food, new farmers may be more willing to try farming in your community. No matter if you’re a power shopper that wants to get in and get out of the farmers market, or a meanderer like me, who uses the market as a way to shake off the stresses of a long work day, a farmers market brings vitality and energy to the community and is well worth supporting.